Editor's Note: Guest author Phil Ridout is an independent consultant specialising in Knowledge Management. He is a facilitator for the Knowledge and Innovation Network (KIN) a business to business knowledge sharing network. Last year the network I help to run, KIN, decided to start using Google Sites for their shared online space called MemberSpace. This ‘MemberSpace’ is used as a repository for shared documents and information about various KIN events. 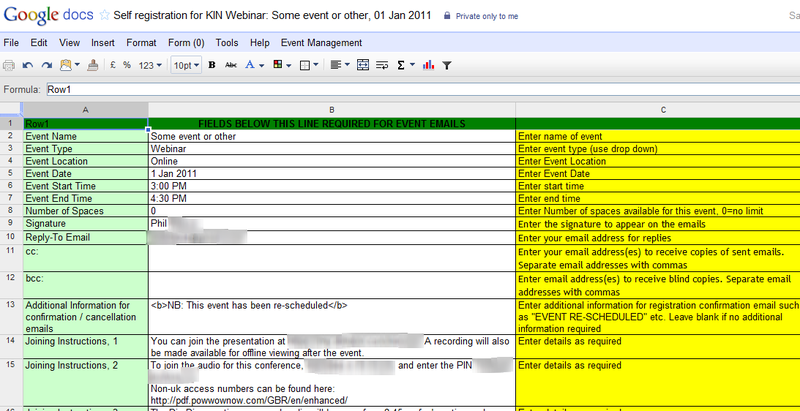 I soon realised that using Google Apps Script would significantly enhance the event management process. 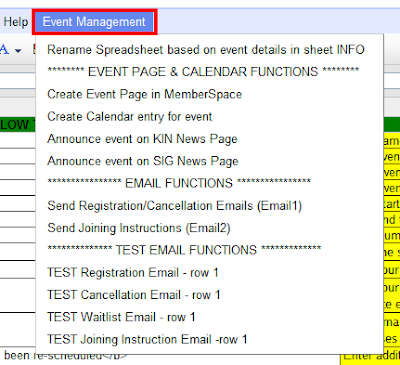 By using Google Apps Script, we have been able to automate all of the above tasks and make event management a lot simpler. To accomplish this automation, we have created an event management spreadsheet template with an accompanying form and script. 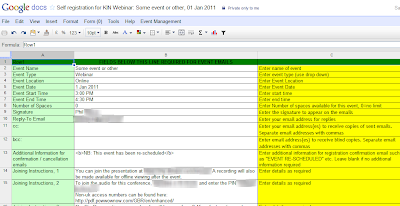 Whenever an event is organised, the event facilitator copies the event management template and fills in standard data about the event in one of the sheets. So what’s in the script behind this? Whenever an attendee registers for an event, we need to send a customised confirmation email. This script is based on the Simple Mail Merge Google Apps Script tutorial code and we use an onFormSubmit trigger to automatically run the script to email registration confirmation to delegates when they submit a registration form. Mail Services in Apps Script are used to send these emails. The ‘Create Event Page’ script is invoked by the facilitator to create an event page (using Apps Script Sites Services) in the MemberSpace using one of three page templates depending on the event type. Should any event details change, this script can be run again to delete the original page and create a new one with the amended details. Once the event page has been created, the organiser creates an entry in the calendar by running the ‘Create Calendar Entry’ script which generates a calendar entry containing a link to the previously created event page in the MemberSpace. This script uses Apps Script Calendar Services. A week or so before the event takes place, joining instructions are sent to delegates using a menu option from the original spreadsheet. This runs a slightly modified version of the email script used in step 1. Performing the above tasks manually may seem simple or trivial but it can be time consuming and error prone. By using Apps Script, we have implemented event management functionality that allows us to manage events in a standardised way.